Some of the neighborhood names in northeast Seattle started out as plat names, then gradually became the identifiers for whole areas. Wedgwood started as a plat name filed by developer Albert Balch in July 1941, from NE 80th to 85th Streets, 30th to 35th Avenues NE. This previously-undeveloped forty-acre tract became so well-known for its charming Cape Cod-style cottages that the name “Wedgwood” spread to become the identity of the whole neighborhood. Hawthorne Hills was originally a plat name which now describes the northeast Seattle neighborhood around NE 55th Street at 40th Ave NE. At that intersection the Burke-Gilman Trail follows the line of a former railroad route and proceeds eastward toward Lake Washington. Author’s note: text and photos in this article are protected under a Creative Commons Copyright. The Burke-Gilman Trail crosses 40th Ave NE and continues eastward toward Lake Washington. To the left of the photo is the Metropolitan Market Grocery Store at the corner of NE 55th Street and 40th Ave NE in the Hawthorne Hills neighborhood. Photo by Valarie. To “file a plat” means to take a section of land and have it surveyed with streets and lots marked out, and register it with the land use department of local government. Filing a plat usually means that either the landowner is going to build something himself, or sell lots for houses or for commercial buildings. When people file a plat with the city or county, they choose a name for the plat but they do not have to give any explanation for the name. This lack of explanation causes curious historians (like me) to wonder about the origins of the plat names. “Plat names” is a category on this blog and you can read my speculations, such as guessing that “Oneida Gardens” was named for Oneida, NY, hometown of Mrs. Charles Baker. Ervin S. Goodwin was a very active real estate developer in the early 1900s. He platted Hawthorne Hills, Olympic Hills, and Victory Heights. Source: Argus Cartoons, Men Behind the Seattle Spirit, 1906. Some plat names of northeast Seattle are straightforward, such as the Mary Chandler plat at what is now the Picardo P-Patch: Mary Chandler gave her plat her own name. Some plats were named for important events, such as Exposition Heights, in honor of the Alaska-Yukon-Pacific Exposition in 1909. Many plat names in northeast Seattle were the creation of real estate developers, such as View Ridge and Laurelhurst. A plat name can honor a historical figure (Roosevelt) a place (Ravenna, Italy) or a local businessman. The Hawthorne Hills plat was named for Hawthorne Kingsbury Dent, a prominent Seattle insurance executive of the early 1900s. After working for an insurance company for twenty years, in 1923 H.K. Dent went out on his own to establish General Insurance Company of America, the predecessor of SAFECO. In 1928 H.K. Dent decided to sell undeveloped land which he owned at what is now NE 55th to 65th Streets, east of 45th Ave NE. The property was purchased for about $200,000 by the Goodwin Real Estate Company. Developer Ervin S. Goodwin, also known for Victory Heights and Olympic Hills in the Lake City area, named Hawthorne Hills in honor of Hawthorne K. Dent. Fire Station 38 at 4004 NE 55th Street in Hawthorne Hills. Hawthorne Hills, like Wedgwood, is an example of a plat name which spread and became generalized to include a whole neighborhood. Today the area around 40th Ave NE at NE 55th Street is known as Hawthorne Hills, even though this intersection was not included in the original plat. 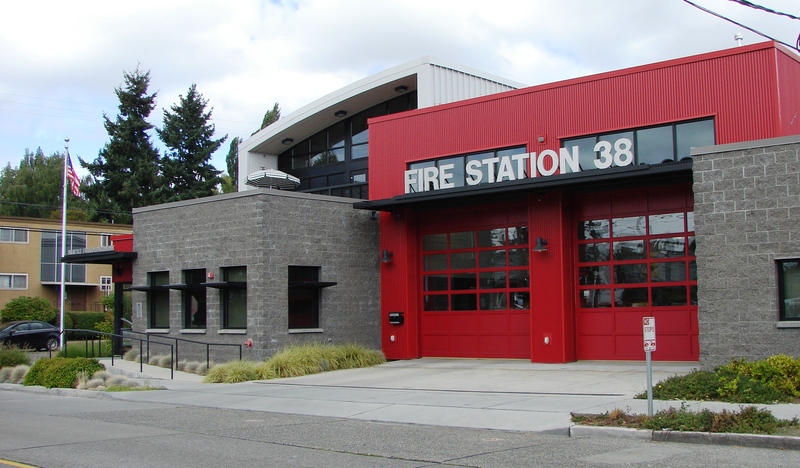 The newest feature at the intersection is Fire Station 38, completed in March 2011 and called the Hawthorne Hills station. 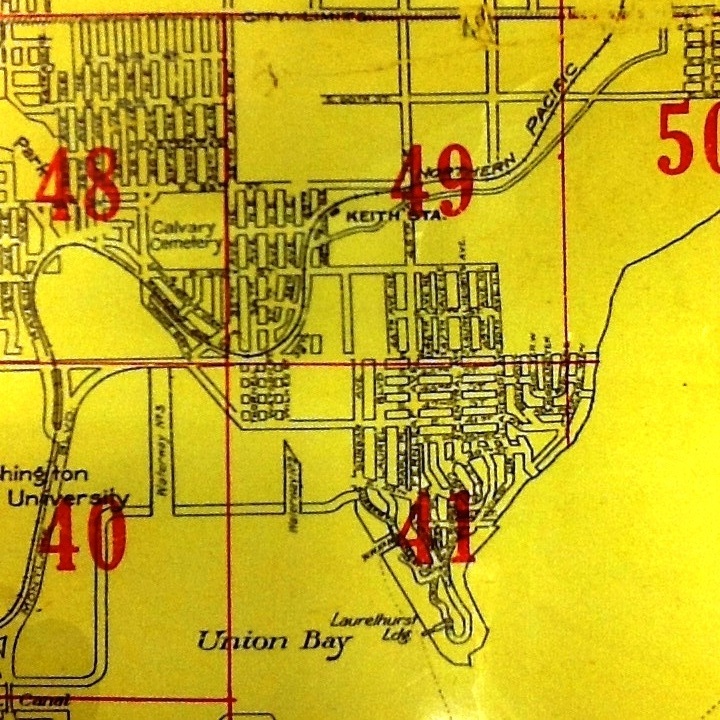 Prior to the platting of Hawthorne Hills in 1928, the area around 40th Ave NE at NE 55th Street was marked on maps as Keith, a stop on the Seattle, Lake Shore & Eastern Railroad. Who was Keith? On the Kroll Map of 1912 (below) we see the large red numerals of the map indexing system, and “Keith Station” is marked next to numeral 49. We see Calvary Cemetery, established 1889, at the corner of 35th Ave NE on NE 55th Street, and Keith Station is at 40th Ave NE, about where Metropolitan Market grocery store is now. Keith Station was listed in the Seattle City Directories until at least 1920 as a mail stop and a passenger station on the Northern Pacific Railroad which took over the SLS&E route. Census records show that in 1880 a man named Jacob Keith, age 36 and born in Ohio, was living near the intersection of NE 55th Street at 40th Ave NE in Seattle with his wife Lucinda and their daughter Iva. When Jacob Keith was a teenager in the 1850s his parents moved the family from Ohio to Iowa, where Jacob became a carpenter. Almost immediately after Jacob’s marriage to Lucinda on December 23, 1871 in Iowa, the couple went to California. Their first child, daughter Iva, was born in California in 1873. By or before 1880 the Jacob Keith family moved again, this time to northeast Seattle in Washington Territory. The Keith family residence in northeast Seattle in 1880 was so early, it is difficult to know what they did there to sustain themselves financially. Their residence pre-dated the sawmill at Yesler (Laurelhurst) and the boatyard and brickyard at Pontiac on Lake Washington, where jobs became available later in the 1880s, but by then the Keith family had moved away. On the census of 1880 Jacob Keith was listed as a farmer, which often meant mainly a landowner. He may have gone to work for others as a carpenter. He may have logged the trees on his property for income, or hunted for game to sell at meat markets, since in the 1880s northeast Seattle was home to plenty of deer and other wildlife. Original King County record books like these tattered journals are kept in temperature-controlled vaults at the Puget Sound Regional Archives in Bellevue. 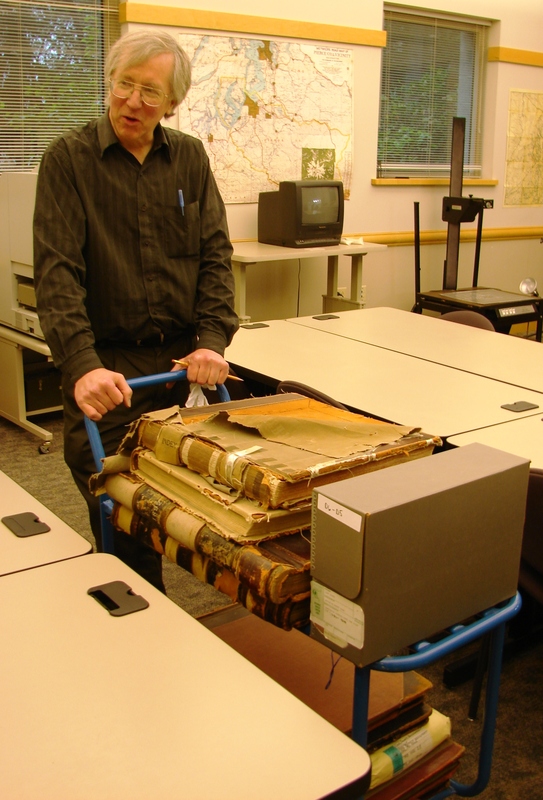 Greg Lange, research assistant, is shown here bringing out books to be opened in the research room, as I did to search for Keith family land transactions. Jacob and Lucinda Keith did not stay to see the SLS&E Railroad start running in 1887. That year the Keiths, along with daughters Iva and Myrtle, went to Maple Valley in south King County and took out a homestead claim for 160 acres of land. Even though the Keiths were no longer living on their Seattle property by 1887, the SLS&E Railroad set up “Keith Station,” forever afterward designated as such on maps. I found the Keith Station listed in the Seattle City Directory as late as 1920. It was surprising to me that this station name was kept for more than thirty years after the Keith family moved away. On the other hand, there was nothing else to call it, as prior to that time there were no other landmarks or neighborhood names around the station site. It was not until the Hawthorne Hill plat was filed in 1928 that the area gained streets. Picnic tables and a path to the Metropolitan Market grocery store are adjacent to the Burke-Gilman Trail just off of 40th Ave NE. With the waning of the railroad era and the rise of northeast Seattle residential neighborhoods in the 1920s, it is not surprising that the name “Keith” fell into disuse. Beginning in 1928 when the Hawthorne Hills plat was filed by the Goodwin Realty Company, the development was heavily advertised until the name became commonly recognized. “Hawthorne Hills for Scenic Thrills” was the slogan that ran on the real estate page in the newspapers every day during the summer of 1928. We see that over time, the plat name spread in usage and is now considered the neighborhood name for a wider area than the original Hawthorne Hills plat. The curving route of the former SLS&E Railroad is today the Burke-Gilman Trail. The Trail crosses 40th Ave NE just south of NE 55th Street and goes along the south side of Metropolitan Market. There you may sit and ponder at a picnic table on the site of the former Keith Station. Jacob and Lucinda Keith must have once stood at that very spot, pondering the coming of the railroad. In this building, the Puget Sound Regional Archives, the original property records of King County are stored in temperature-controlled vaults. Census and Seattle City Directory listings for Jacob Keith. “Hawthorne Dent North End Tract Brings $200,000.” Seattle Daily Times, June 17, 1928, page 26. Kroll Map of 1912, UW Libraries Special Collections; our thanks to David B. Williams for the map photo used in this article. Mr. Williams is the author of Too High and Too Steep and other books about the geology and natural history of the Seattle area. Take a look at his list of books and his schedule of walks and talks around town. Another new book, Waterways, co-written with Jennifer Ott of HistoryLink, came out in 2017 for the centennial of Seattle’s ship canal. McKee’s Correct Road Map of Seattle and Vicinity, 1894. (See below) Seattle Room, Seattle Public Library. Men Behind the Seattle Spirit: the Argus Cartoons, 1906. Seattle Room, Seattle Public Library. 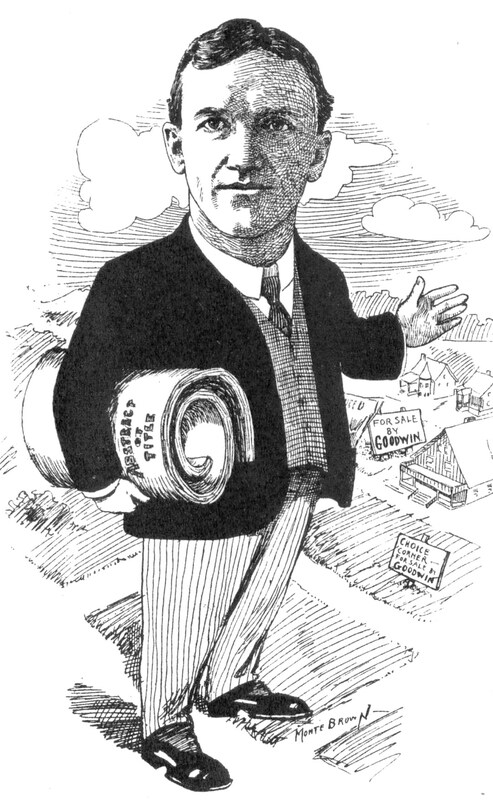 Cartoon depiction of developer Ervin S. Goodwin. Property records: Grantor-Grantee Index 1885 to 1890, Jacob Keith. Puget Sound Regional Archives, Bellevue, WA. Accessed Aug. 30, 2013. “Remembering H.K. Dent,” HistoryLink Essay #8700 by Russ Banham, 2008. “Seattle’s Most Unusual New Residential District Opens Today,” Seattle Daily Times, July 8, 1928, page 24. McKee’s Correct Road Map of Seattle and Vicinity, 1894, courtesy of the Seattle Room, Seattle Public Library. The dotted line marked “City Line” is the Seattle City Limits as of this year. 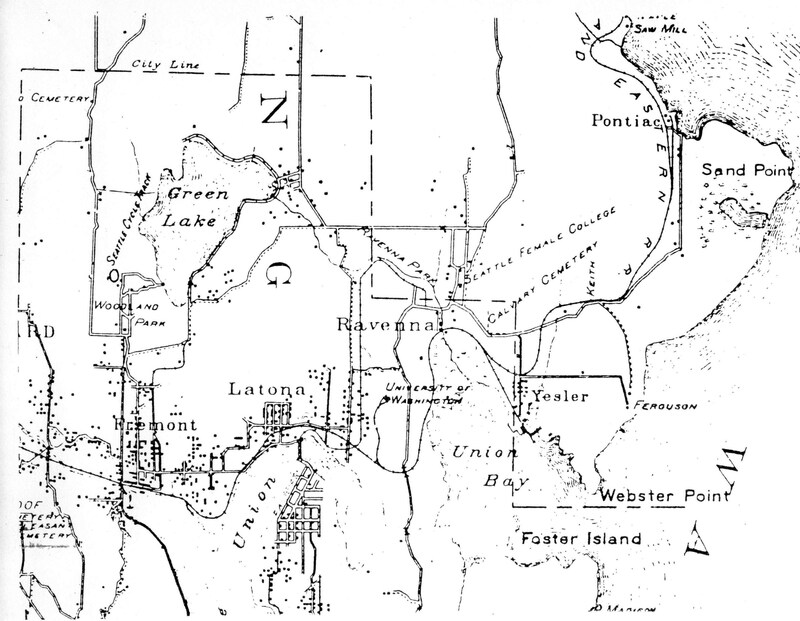 The snaking line of the SLS&E Railroad is shown through the communities of Fremont, Latona (Wallingford), Ravenna, Yesler (Laurelhurst) and heading north past Sand Point. The black dots indicate population clusters. Calvary Cemetery, established 1889, is a point of reference at the corner of NE 55th Street and 35th Ave NE. The Keith Station is marked at NE 55th Street and 40th Ave NE on the railroad line — the word “Keith” is written vertically just below the word Cemetery. This entry was posted in name of the neighborhood, Plat names and tagged Burke-Gilman Trail, Kroll map, McKee's map of 1894, Neighborhood History, northeast seattle, railroad, real estate developers, Seattle, WP Longform. Bookmark the permalink.